The barrier isn’t meant to be broken. Sometimes the big, bad city is draining to a family’s well-being, and that’s where the Creeds stand. Doctor Louis Creed (Jason Clarke) and matriarch Rachel (Amy Seimetz) have decided to move their children, Ellie, (Jeté Laurence) and Gage (Lucas Lavoie) from Boston, Mass to substantially smaller Ludlow, Maine. Their expansive, woodsy backyard is inviting for Louis to spend more relaxing time with his loved ones. The open countryside is also inviting to some other stuff, including a Pet Sematary—where people have long buried their pets—located in the heart of their backyard. Locals treat the mystical location in high, revered regard. When an unspeakable tragedy happens to the Creeds, Louis gets the idea to test out what powers the spot really has from neighbor Jud Crandall (John Lithgow). Nothing will ever be the same. If there’s one author who seemingly carries a lucky rabbit’s foot in their back pocket when it comes to adapting their stories, it’s got to be Stephen King. Whether for television or the silver screen, most of his material seems to benefit from simply lending itself strong enough to not lose a ton in the way of translation, and/or studios pairing the right talents to bring out (and keep) the essence of his work. 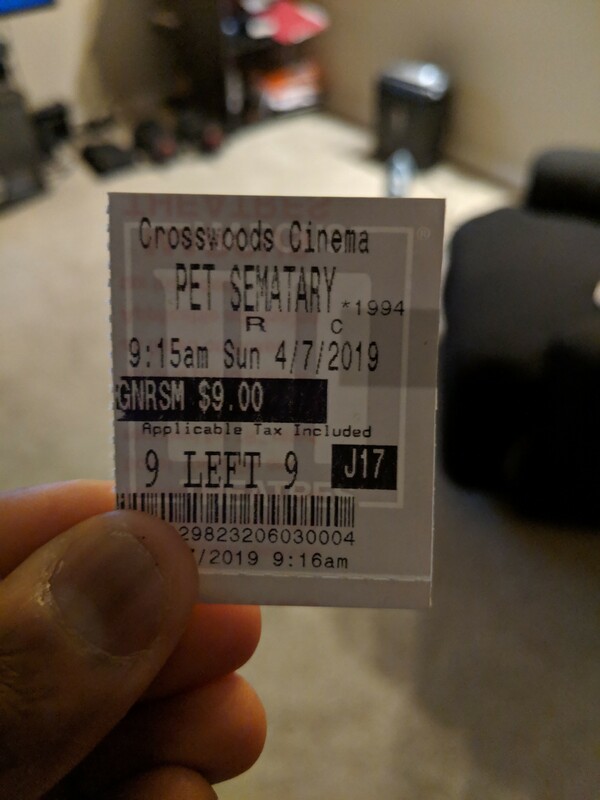 We’ve seen an update with IT, and now Pet Sematary. Hairballs certainly exist, but it’s a pretty confidently made update from the 1989 original. Pet Sematary may play better for those uninitiated to both the first version and the novel (such as myself). Co-directors Kevin Kölsch and Dennis Widmyer (Starry Eyes, a poor man’s The Neon Demon) along with credited writers Matt Greenberg and Jeff “Bueller” Buhler decide to get controversial and make their own sizable script changes and story setups. The question is, why is their decision deemed controversial? It would be one thing if they were tweaking with a classic, but if they did that, they’d be derided for making a needless shot-for-shot remake. We as a collective populace can never be made happy. Looking past that, the foursome manages to generate substantial atmospheric tension and unease…at least for the first 60-70 minutes of the movie. On one hand, Pet Sematary makes the same mistake many features in their marketing make, revealing way more than necessary, right down to who bites the dust. Think about how that truly could have been a whoa moment if that were left out? On the other, it takes some skill and effort to conjure feelings of dread and doom into a predetermined script destination, and through solid writing, a moody score from Christopher Young, and a heavy theme detailing death and how we process and confront/dance around it, the Creed family chronicles featuring Crandall are rarely boring. This looks like a $20+ million horror movie, save for two CGI instances appearing at the middle and the end. By the simple act of viewing a film, the viewer is suspending disbelief to a varying level. Of course, some films truly test the limits of this fact. Pet Sematary is every adjective previously mentioned, but man, you kind of just have to go with the “no-way-in-hell-this-works” decisions characters make. This is how King generally wrote them, and any issues with the story are his original doing. Unlike an original script, an adapted script is pretty tied town to the central machinations/structure of its origins, and Pet Sematary can only do what King penned to the pad. That includes some backstory with a particular character that turns into a scare or two yet exists outside of the central story for all intents and purposes. Hate cats and/or scared of them? This retelling will only deepen those feelings. All four felines playing Church steal the show. Church’s family isn’t too bad, though. Kids are always hit and miss in horror, so credit to Laurence and Lavoie for being more of the former. Clarke and Seimetz are one in the same, meaning that they’re not the type to raise a movie’s ceiling, but they’re also not going to be the reasons why it fails. Finally, the reliable Lithgow is mainly used for exposition, however, he fits well within the setting and is the best pure dramatic actor of the cast. Photo credits go to thisisinsider.com, ew.com, and ign.com.